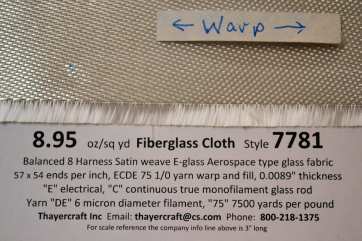 Style 7781 is one of the most predominately used satin weaves in the Aerospace Industry. We sell a lot to other creative users for a huge variety of projects. 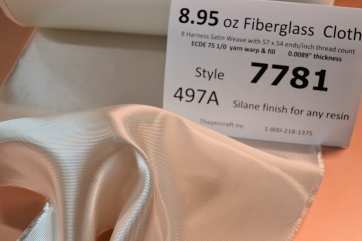 7781 is an 8.95 oz/sq yd 8 harness satin weave with a thread count of 57 x 54 ends/inch and uses the DE 6 micron glass filament versus the 9 micron G filament in style 1581. The smaller filament would suggest a higher tensile strength of course. The ECDE 75 1/0 flat yarn used in both the warp and fill, the thread count of 57 x 54 ends per inch and the 8 harness satin weaver makes for a very efficient use of space. 7781 for the regular guy doing an open lay up without vacuum bagging or using a thin resin will have some problems with air entrapment. Some solutions to this problem outside of vacuum bagging are with the use of peel ply and maybe some combining with other more open weave fabrics. All widths of 7781 listed on this page are finished in the superior structural aerospace finish 497A. 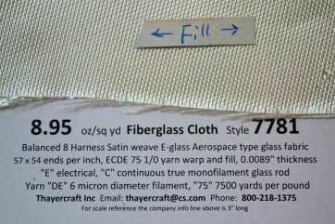 497A is not as soft as 504 Volan but does produce somewhat stronger laminates. 7781 with the 497A finish is available in 15, 38, 50 and 60" widths. The 15" seems to be somewhat stiffer than the other widths for some reason. May be the way the speed the more narrow width is finished. 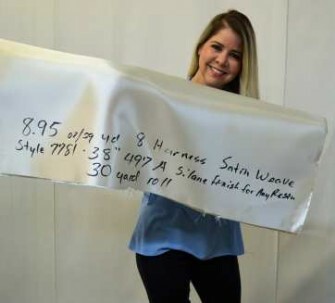 In general the 497A is a pretty soft fiberglass cloth with only 504 Volan being softer. 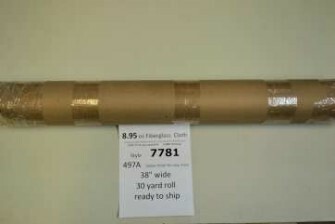 Rolls come in 10, 20, 30, 50 and 125 yard rolls and are on 2" PVC. Style 6781, the S-2 Glass version of 7781.